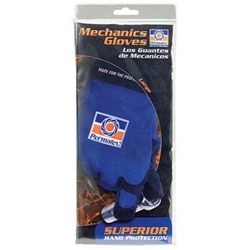 Permatex 85310 Mechanics Gloves safeguard hands from harsh work environments where superior hand protection is required. Designed to offer durable, comfortable protection, the triple layer fabric prevents against nicks, cuts and abrasions. *** Mechanics gloves are tough and lightweight, and feature an elastic cuff with an adjustable hook and loop closure to ensure a secure fit. *Does not protect against chemical compounds or hot exhaust systems. Gloves are not fire retardant or flame proof.